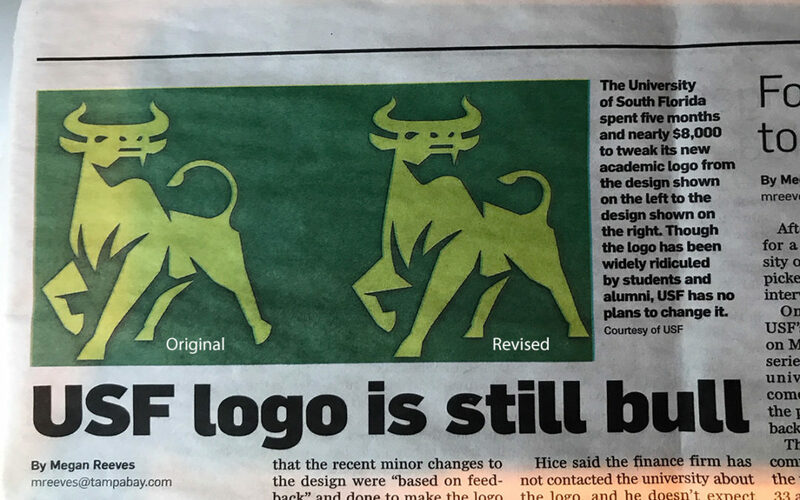 On a recent flight I was reading about University of South Florida’s quest to revise their academic logo and all the public “feedback” that came with the project. After $47K with no discernible results the university spent an additional $8,000 to revise its current logo (left) to a slightly modified version (right). This illustration simply reminded me how difficult the logo design process is and the more hands in the pot, the more difficult the process is. Additionally, many outside observers, including those who have been commenting ruthlessly on USF’s Facebook Page don’t completely realize how difficult it is to accommodate all the stakeholders nor how entrenched and costly it is to introduce a revised logo. Imagine all the places the USF Bull appears throughout the school including book covers, recruiting materials, academic reports, signage, awards and that’s just scratching the surface. Still it’s difficult for some to understand when I tell them that a logo is much more than a sketch on a piece of paper and perhaps more complicated that paying somebody a hundred bucks on “fiver” for a piece of clip art. Everything else is completely optional.